ORLANDO - Sport and Recreation is a major contributor to Florida’s economy with activities providing over $57 billion in total economic output, creating over 580,000 jobs and attracting nearly 16 million non-resident visitors to Florida. The contributions of Florida’s county and municipal Parks & Recreation Departments to Sport Tourism provide the maintenance and infrastructure to support numerous annual sporting and recreational activities throughout the state of Florida. 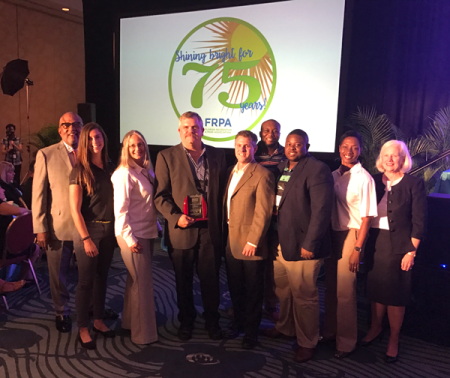 The Florida Sports Foundation presented the Fourth Annual Excellence in Sport Tourism Mid to Large Sport Market Award to the City of Plantation Parks and Recreation Department and the Small Sport Market Award to the Charlotte County Community Services Department at the Annual Florida Recreation and Parks Association Conference in Orlando. Charlotte County Award Photo ID - Left to right: Chester Pruitt, President FRPA; Amanda Capone, Florida Sports Foundation; Michelle Long, Charlotte County Community Services; Mike Koenig, Charlotte County Community Services; Sean Dougherty, Punta Gorda/Englewood Beach VCB; Michael Washington, Florida Sports Foundation; Dennis Edwards, Charlotte County Community Services; Angela Suggs, President Florida Sports Foundation and Joan Byrne, FRPA President Elect. The Florida Sports Foundation, the state’s lead sports promotion and development organization, works in conjunction with Florida’s 28 local sports commissions to bring more than 3,200 sports events and $57 billion in economic impact annually to the State. For more information about the Florida Sports Foundation and its programs, visit www.flasports.com.